VEDIC LINE On Taut Face Pack comes in a very similar packaging like other Vedic Line Products. 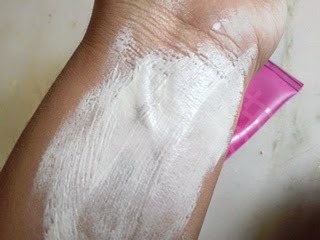 The packaging of almost all of its products is same in a tube with a flip top and so is of this On Taut Face Pack. This face pack is specially meant to improve SKIN ELASTICITY and revive it all over along with removing its tan. My skin is a combination skin, it appears oily sometimes dry and mostly dry in winters, so I thought this could be the best time to try this Vedic Line On Taut Face Pack to see how much elasticity its improves on a dull rough skin in winters and so I tried this few days back and here is my review on it. WHAT VEDIC LINE TAUT FACE PACK CLAIMS? & Chamomile Extract, Vitamin B3 & Vitamin C to firm up tissues & remove mild tan. Price - Rs 175/- for 75ml. This Vedic Line face pack comes in a similar tube packaging like its other products, the only difference you can through its color. The color of almost all of its products tube is very different from each other. 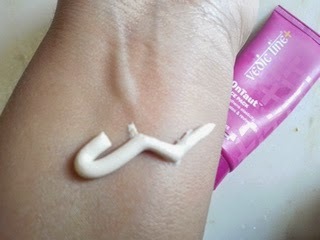 I did a post of Vedic Line Meladyne Depigmenation Cream which comes in a green colored tube. The overall tube colors is different of all the products, which makes a lot easy to distinguish this products from each other otherwise same tube, same packaging, same design makes it extremely different to identify the products. This taut pack is slightly creamy and does not feel to dry like most pf the face pack. Another feature which differentiates this pack from other face packs is its cooling effect even on sensitive skin without a tingling sensation. I have quite sensitive skin and I normally feel a tingling sensation with slight itching with most of the face packs if lest for a little long, but in this case I did not feel any itching neither any dryness even leaving the pack on face for long. This is what I like most about this Vedic Line face pack and can truly say its one of the BEST FACE PACK FOR DRY SENSITIVE SKIN. I don't think people with Oily skin would want to use this pack since oily skin has its natural glow. Along with that the fragrance of the pack is also non irritating even if applied for long, one can easily bear it. Now coming to its effect in improving skin elasticity and its texture. I applied this pack twice in a week and did this for a total of 2 weeks till now and felt the difference right from 1st application. I applied the pack on my face after using my all time favorite Clean & Clear Foaming Facial Wash. Then I applied this pack, left it for 10 minutes without toughing then massages it little bit all over with the help of few drops of water and then again left for 10 minutes. Finally I just washed it off following with a moisturizer. I did this before sleeping so that my skin could relax and could get the advantage of this pack. I could clearly see a nice glow on a face the next morning. My skin appeared to be much smoother and clear overall revived as claimed but all this did not happened overnight after just one application. It took bout 2 weeks to see this change in my skin. 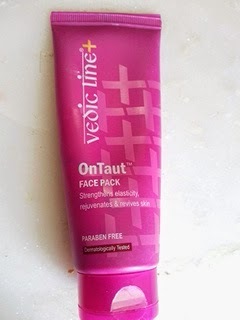 Overall I am very happy with this Vedic Line On Taut Face Pack and definitely recommend it to anyone having dull dry skin which lacks elasticity. You wont difference in a single but if used for few along with proper care would definitely result in nice glowing skin. I cannot say anything about its role in TAN REMOVAL, since I was not suffering from a tanned skin and have no idea about its effect in tan reduction. Best anti aging face pack for dry skin. Improves skin elasticity as claimed. Improves skin texture reviving overall skin appearance. One tube quite sufficient for enough usage application. Might not be beneficial for oily skin.